There is nothing more relaxing than a weekend at Lake Meade. This home features 4 bedrooms and 3 full baths making it functional, adaptable of full of appeal. Plenty of windows provide natural lighting and a wrap around composite deck gives you full lake views and plenty outdoor space. A covered walk-out patio allows you to be outdoors and be shaded or take cover during a rain shower. With the protected deck above you won~t feel a drop of rain and still get to enjoy the views of the lake. This home offers plenty of indoor and outdoor storage space for all your water sport and boating equipment. The 2 fireplaces make sure you will feel cozy all year round with the warmth of propane provided by Aero Energy. The second-floor loft offers a great view of the water and a chance to unwind and get away. The lower level has another full kitchen for entertaining, a bar adjoins the family room, full bath and laundry area. The spacious heated utility room is accessible from inside and out making this another perfect spot to store water sport equipment and your lawn and garden tools. This home has 75~ of waterfront shoreline, a composite dock with a manual lift and docking availability for 2 power boats. There are steps that lead in the lake for easy access for pets and people to enjoy some swimming or just floating. 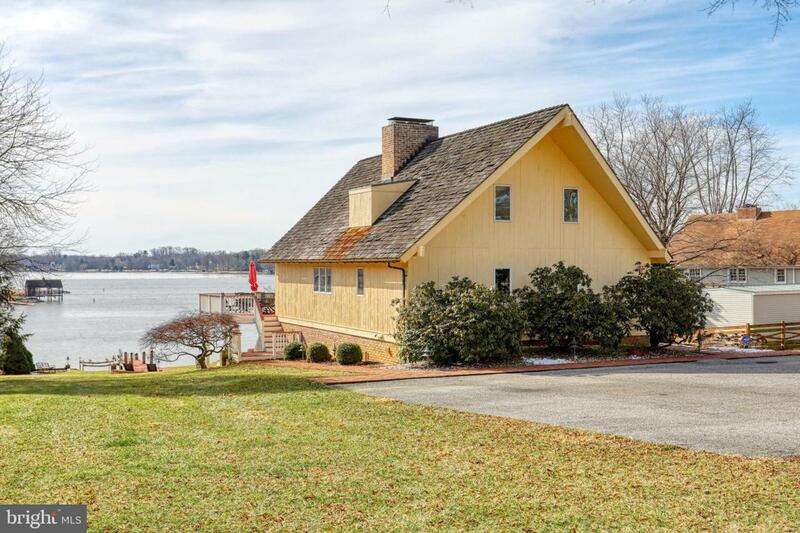 This home has a fabulous view of the lake and is just inside the entrance.